Prof Victoria Haskins - Roundtable discussion on "Regulating domestic service in colonial societies"
Professor Haskins attended the European Social Science History Conference 2018 and was a panel member on this important roundtable discussion. Dr Kelly, Purai Academic, was given special permission to address the members of the Upper House in parliament time on 11 October 2017 and spoke on the importance of language to Aboriginal people in NSW and the significance of the proposed Bill. Purai Co-Director Professor John Maynard speaking at the Birckbeck Institute for the Humanities at the University of London on October 3, 2017. On Monday 27 October 2014, Purai in association with the UoN Politics Discipline hosted a seminar with Professor Rajeshwari Deshpande on two key and overlapping themes of contemporary Indian politics and their implications for politics-policy interface: social security and women's empowerment. Through the case study of domestic workers in two Indian states, Professor Deshpande explored the sudden visibility assigned to the marginal sections of the urban informal sector workers in the policy discourse of the Indian state and its implications for the collective political action of the poor in India. A public talk for the ReOccupying the Political workshop was hosted by Purai on Friday 26 September 2014, at University House, Auckland Street, Newcastle, with the generous support of the Australian Political Studies Association, and the Faculty of Business and Law. Speakers Dr Gary Foley (Senior Lecturer, Victoria University), Dr Sara Motta (Senior Lecturer, University of Newcastle), and Professor Chris Mullard (Visiting Professor at the Royal Agricultural College, Cirencester, UK) discussed the subject of "Silence, Violence and Myths of Social Inclusion." There was a good attendance here also, and an invigorating conversation followed. 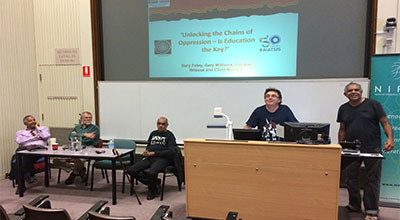 Unlocking the Chains of Oppression – is education the key? The Yuraki History, Politics and Culture Node of the National Indigenous Research and Knowledge's Network (NIRAKN) in conjunction with the Wollotuka Institute and Purai Global Indigenous and Diaspora Research Studies Centre proudly presented a day with legends of the political struggle, featuring Aboriginal political activists Gary Williams, Gary Foley and Gordon Briscoe joined by eminent British scholar and activist Professor Chris Mullard. These four men first met in 1974 when Charles Perkins invited Chris Mullard to Australia to investigate the shocking living conditions and inequality of Aboriginal life. Chris subsequently produced the study Aborigines in Australia today that had been commissioned by the National Aboriginal Forum. 120 University staff, students and community were in attendance listening to their stories of the long political fight for justice and gaining an understanding of why they chose their academic paths. 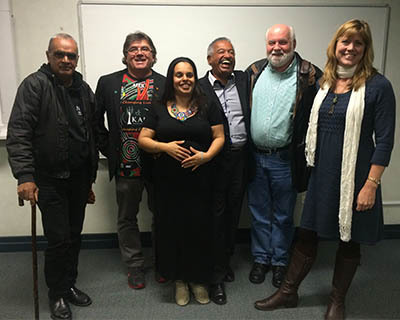 Lena Rodriguez presented at the 2014 World Congress of Sociology in Yokohama, in July 2014. Her paper: "Constructing Transnational Polynesian Identities: Soldiers, Sportsmen and Illegitimate Masculinities." Victoria Haskins presented a plenary paper, '"They shew no signs of resistance": intimate violence and the domestic frontier,' at the 2014 Australian Historical Association annual conference in Brisbane, with Purai external affiliate Professor Lynette Russell of Monash University, and Dr Angela Wanhalla, University of Otago. This research symposium was organised as part of Victoria Haskins' Future Fellowship (2009-2013) research project, In Her Place: state intervention and Indigenous domestic service in Australia and the United States, 1880-1945. Two colleagues, Dr Claire Lowrie, and Professor Pam Nilan, were co-organizers and co-convenors. The aim of this symposium was to bring together scholars to share insights and to enter into a conversation about the connections between domestic service and colonization. We understand colonization to refer to the expropriation and exploitation of land and resources by one group over others, and to encompass imperial/extraction and settler modes of colonization, internal colonization and slavery, and present-day neocolonialism. This symposium provided an opportunity to workshop individual papers in a collegial environment, drawing out key themes, topics and issues across different sites and times. A selection of the workshopped papers will be included as peer-reviewed chapters in a book published by an international academic press. What is the relationship between domestic service and colonization, historically and into the present? How do the experiences and patterns of domestic service connect with processes of dispossession, displacement, and invasion, and the social and cultural upheavals that such processes generate? What is the relationship between colonization, and the gendering and racializing of domestic service? Is there a difference between domestic service in settler and non-settler colonies? Have such differences affected contemporary domestic service patterns? How has colonization impacted on domestic service not only in the places being colonized, but in the colonizing society "back home"? What are the historical parallels and connections between domestic service under colonization, and the transnational nature of much domestic work today? What was/is the impact of colonization on political organization, activism and resistance in domestic service? How and why have colonizing regimes sought to manage domestic labour, and can we see similar or continuous developments in postcolonial states and neocolonial contexts? What are the implications for calls for government regulation of domestic work, particularly of migrant domestic work, today? Three keynote speakers were invited to address the symposium: Professor Mary Romero of Arizona State University (who had been a mentor on the Fellowship application), Associate Professor Swapna Banerjee of Brooklyn College, City University of New York (CUNY), and Emeritus Professor Barry Higman, of ANU. The composition was very international, with speakers from the United States (5, including two of the three keynotes), Canada (2), New Zealand (2), the United Kingdom (2), Turkey (1), Singapore (1), South Africa (1), Papua New Guinea (1), and Australia (6, including one of the keynotes, as well as the 3 convenors and a special guest chair). Of the Australian speakers, two were from regional NSW (Armidale and the Blue Mountains), one from Sydney, one from Brisbane (Southport), one from Canberra, and one from Perth. Speakers included established scholars of international renown and emerging scholars, as well as two postgraduate students. Registered attendees also ranged from leading scholars to postgraduate students, and came from around Australia, with one attending from the UK. There was a range of disciplines represented including: history, anthropology, gender studies, geography, fine art, and law. The symposium organizing committee decided upon five panels, which collectively reflected both the original aims of the conference and the submissions received. These were: Resistance; Intimacies and Anxieties; the State and Domestic Service; Settler Colonialism and Domestic Service; and Comparisons and Legacies. Keynote speakers were Professor Mary Romero (Arizona State University), Professor Barry Higman (ANU), and Associate Professor Swapna Banerjee (Brooklyn College of CUNY).